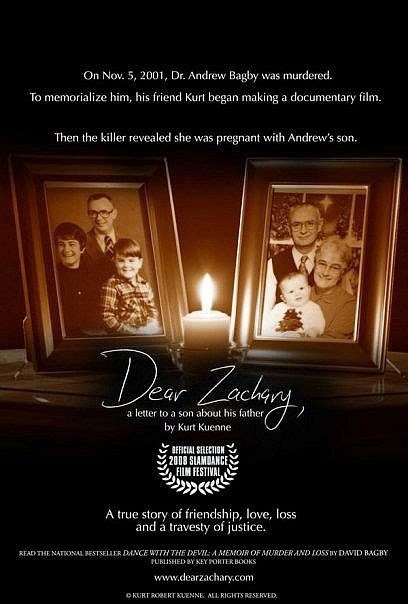 Dear Zachary, a visceral and shocking documentary, is a film about absolute, profound evil. A shuddering, harrowing investigation into brutal horror, Kurt Kuenne's movie also reminds us that where there is darkness, there too must be light. In wicked suffering, love is the greatest healer of all. Zachary Bagby is a child who will grow up fatherless - his Dad, Andrew, was gunned down before they had a chance to meet. How perverse, thought Kurt, a close friend of our hero, that the young child will never know such a remarkable, kind man. Armed with a set of video cameras, the film-maker sets out to interview all those who knew Andrew Bagby - this movie was to be a tribute to a gentle soul taken before his time, and a visual letter to the infant Zachary too. "I vowed to collect every memory of you before they were gone," Kuenne narrates. Soon it becomes clear, however, that all is not as it seems. The prime suspect in Andrew Bagby's murder we discover is the Canadian GP Shirley Turner. Fleeing criminal proceedings to Newfoundland, Turner must be extradited back to the United States before she can be charged for her wrong-doings - in the interim, whilst she delays justice as long as possible, she gives birth to Andrew's son Zachary. Whilst legal proceedings drag out from weeks to months, to years, Turner is pursued to the remote province by a couple who want to help raise the young child. Heart-breakingly, the pair are Andrew's parents who have sold their home and moved hundreds of miles to be close to Zachary. The only way they can have access to their grandson is by co-operating with the woman they understand to have murdered their only child. Their sacrifices and selflessness, their innate goodness, is tested to the extreme by a being so foul, it is impossible to comprehend just how evil she truly is. When Andrew's father compared her to the devil, he did not mean this as a metaphor. Dear Zachary is a triumph of modern non-fiction cinema. The gripping, labyrinthine narrative unfolds before us as a movie framed as a cinematic eulogy becomes an intense true crime investigation and, seamlessly, transitions back to a heart-warming tribute of love. Kuenne, masterfully edits his footage to shock, jolt and touch the audience. He engrosses us with a multi-strand narrative as we have our expectations shattered time and again - an inventive use of audio, cutting out and crashing in like thunderous waves, complements a skilled film-maker who perfectly selects archive footage to illicit emotions from the audience. Recalling the last time Andrew said goodbye to his mother, the voice-over notes how she kissed and held him - footage rolls of these same actions occurring during Andrew's graduation. Simultaneously, we imagine an unbeknown final farewell which takes on greater significance with each passing day and witness, too, a proud parent interacting with a bright and talented young man who should still be alive - we are stunned by the nonsensical destruction of love. As we hear from the scores of people Andrew touched, this feeling of grotesque injustice grows inside us like a poisoned apple tree. Yet, for a film centred around the most abhorrent evils imaginable, the lasting impression of Kuenne's movie is one of hope - where there is darkness, love will conquer. And this message, above all else, is the perfect tribute to Andrew Bagby, a perfect tribute to those who spread light into an often bleak world.